Today's go-fast (and loud) hatchbacks have come a pretty long way from the original idea of the hot hatch. Back in the 1980s, the idea of a hot hatch was simple: Take a compact family-hauler, insert a larger engine and a stiffer suspension, and stand well clear of the torque steer. But it's 2018 and hot hatches have evolved way beyond that pioneering recipe. Take the Seat Leon Cupra and the Volkswagen Golf R you see here, for example. They are both armed with spunky turbocharged 2.0-litre engines that have close to 300bhp, are thoroughly capable of keeping up with supercars on a nice twisty stretch of back roads, and have cabins that display more sophistication than simplicity. And at this point, you might be thinking - isn't the Leon Cupra a better fit against the Golf GTI? Well, yes, considering they are both front-wheel driven but given the fact that the Leon Cupra is pushing 286bhp on the dyno, we've decided to pit it against the Golf R, which boasts a similar output albeit to all four wheels. The consideration, then, is whether it's wiser to pay lesser for a more fun front-wheel drive with equal power, or top-up for all-wheel drive grip and a fancier badge. On paper, the answer may seem obvious because the Golf R has more torque, a faster 0-100km/h timing and standard all-wheel drive. While both cars have an equal 286bhp, the Golf R has 30Nm more torques, rated at 380Nm. 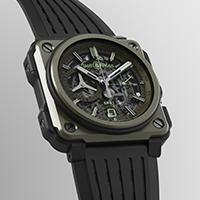 Thus, it'll complete the century sprint in 4.6 seconds, 1.1 seconds faster than the Leon Cupra. 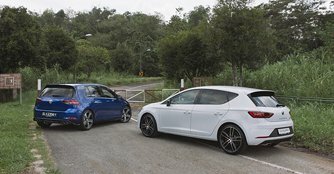 But when you begin driving the two, it's obvious that the Leon Cupra is the most engaging and most entertaining of all the Volkswagen Group's racy mid-size hatchbacks. In corners, the Leon Cupra is more satisfying to chuck through twists and turns, even though the Golf R's grip and composure remain unwavering. The Leon Cupra feels rawer, lighter and more responsive from the go. 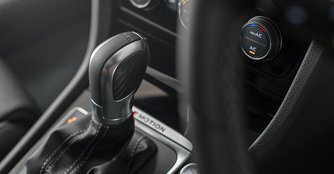 And unlike many modern fast cars that infuse electronics into the braking system to counter wheelspin, the Leon Cupra employs a proper, mechanical limited-slip differential that also feels more natural. The Golf R is fast, but the Leon Cupra is fierce. While the former is peerlessly sophisticated in its ability to subdue the toughest of roads, the latter lets you tingle at its power and push. The trade-off is that as an everyday all-rounder, the Seat is not nearly as refined as its Volkswagen cousin. There's a difference in the way the exhaust is tuned (Golf R's is boomier, Cupra's is juicier), and there's more sound insulation in the Golf R, too. When you take it out of Race mode, the Golf R's engine produces barely a whisper through the cabin. At the same time, it displays the sort of ride pliancy in Comfort setting that Seat would consider languid for a car like the Leon Cupra. Along with the faster acceleration and better everyday comfort, the extra $43,900 for the Golf R (as of 12th March 2018) gets you a cabin that's noticeably of superior quality and maturity. For one, there's the fit and finish, which the Golf R wins hands down, having less dull black surfaces and a nicer-feeling steering wheel. The inside of the Leon Cupra, however, feels slightly cheaper (because it is), especially when considering the Golf R's techy digital displays and tastefully upscale accents. On the outside, the Golf R appears to be the sportier yet more gentlemanly of the two. 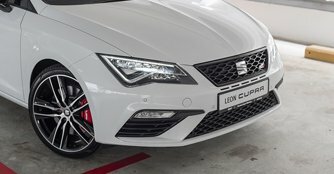 Although it sits on smaller 18-inch wheels (Leon Cupra wears 19-inch ones), it has a more striking front end as well as a more aggressive quad-tailpipe setup. The Leon Cupra on the other hand looks almost too discreet for its intents and purposes. That, of course, boils down entirely to individual preferences. What can't be ignored is the Leon Cupra's much lower $162,500 price tag. 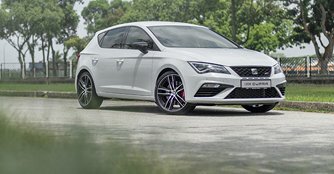 For less money, the Leon Cupra offers a more memorable driving experience, one that's almost intoxicating. In a way, the Seat is sort of like beer. It's not as pricey, but unfussy drinkers will be more than happy to have lots of it. The Golf R is more like whisky. Refined after years of (Volkswagen's) fine-tuning, it's the sort that appeals to men with a penchant for the finer things (and badges) in life. I like both beer and whisky but in this case, being in my late 20s, my heartstrings are pulled more towards the Leon Cupra. If I was older and wanted some plush along with easy power, I'd pick the Golf R.